This Molecular Model Kit has a total of 178 pieces including a link remover. With this set, it is easy to build models for Organic and Inorganic Chemistry! Build models such as: alkanes, alkenes, alkynes, alky halides, alcohols, ethers, aldehydes, ketones, carboxylic acids, nitriles, amines, esters, aromatic compounds, heterocyclic compounds, and more. All parts are made of durable and sturdy plastic which are color coded to national standards. This is a great set for both students and teachers to aid in course studies! Atomic - valence(angle) Color - Qty. Links - color - length(mm) - Qty. ★ FALL IN LOVE WITH CHEMISTRY --- These are so much fun to play with and they help you understand the relationship between molecules. Let you learn the shapes and chemical makeup of all the functions groups you'v so far learned in O-Chem and Inorganic chemistry. ★ BASIC TO ADVANCED LEARNING --- Perfect for kids and other student, whoever you are senior student or college student. Fantastic learning aid for your. If you have had one at home you can practice with your kids. Meanwhile if you are student to playing with it by yourself to brush up on defunct chemistry skills. The pieces all to be sturdy and well made, and can use it for years to come. 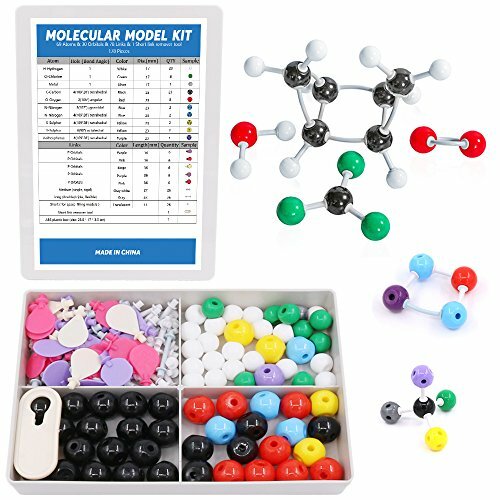 ★ MOLECULE SCIENCE IN 3D --- We have prepared 178 Pcs molecular model set for you, This model contains C, H, O, N, P, S, CI, and other metals and a variety of single and double bonds, long bonds, long keys. Can be put high school, university chemistry in most of the organic or inorganic molecular structure model for the study of experimental operation.